Our most pressing need is for to cover the costs of permanent residency for our family in Panama, a process that we have already begun. Between legal and processing fees, we will need approximately $3,500. Please consider helping us towards this goal! Partner with us by committing to support our work, or through a one-time gift in any amount! By clicking the “Donate” button you will be directed to our Paypal account form (Paypal charges a 3% transaction fee on all credit card donations). 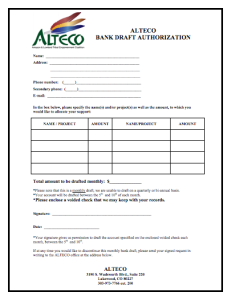 Click to download our “ACH Draft Authorization Form”. Then print, fill out and mail it to our main office with a copy of a voided check attached. Please make check payable to ALTECO and in the memo line write “Drake and Megan Sprague”. Yes! Our agency, ALTECO, is a 501(c)3 non-profit organization incorporated in the state of Colorado, USA. You will receive a donation receipt via mail (or by email if that is your preference) that can be used for your tax records. ALTECO charges a very minimal amount of 5% per donation to cover costs such as accounting, postage and software fees. ALTECO strives to be good stewards of the money the Lord gives, and thanks to the donation of office space, equipment and supplies, it maintains very low overhead.